Ruleset: Nepheris' Build a City Challenge Version with some tweaks of my own here. I will be adding some custom careers to the mix with their own rules to unlock. Note: I'm playing with mods/hacks including community time, ACR, and a many other to make the game more "realistic." Visit this page if you want a complete listing of my mods and hacks. Style: A combination of documentary and plotted storyline (more of these if I could). If you want spoilers and want to know the current status, you can visit the database. LOL. I just noticed that I named my siggy wrong for this city. 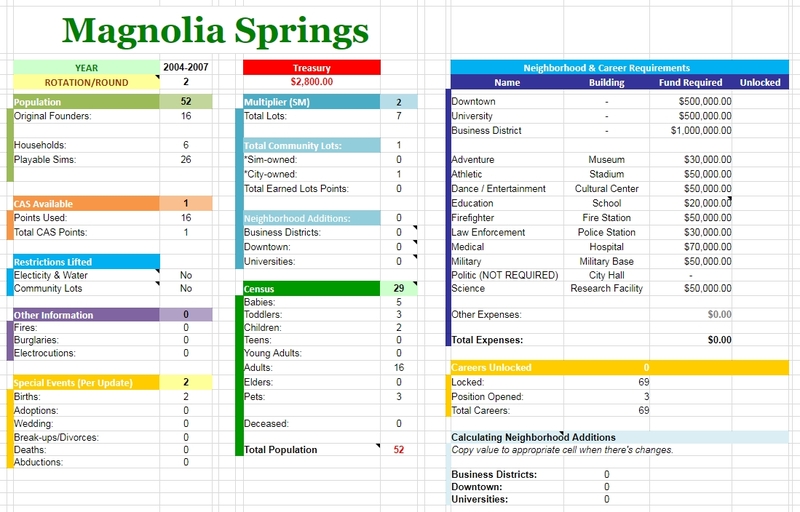 It's supposed to say "Magnolia Springs". Last edited by Iya on August 4th, 2017, 8:27 pm, edited 17 times in total. This kind of BACC always interested me but made me nervous to keep track of. But the way you've done it is amazing! I'm really excited to see what's coming next! keeping track of it is hard, but thanks to EXCEL, I've set up the sheets so that everything will automatically calculate for me. Now, I only have to add new characters and their info as well as the new business and its info and everything else is will change accordingly to the rules. I have one for Nepheris' version of BaCC and one for the orginal version. If you would like it, I don't mind sharing. So far so good! The town is beautiful and so are your Sims. I like your spreadsheet, too. If you don't mind sharing it, that would be amazing! Thank you so much! Round 1 of the Craven's family is updated. Enjoy! I will upload them as soon as I clean the sheets to give you clean data. It will be uploaded with the next update. I've been away for so long, I'm surprised I still remember my notes for this BaCC. Anyway, I'm back for Spring Break and hopefully get more updates coming. At the moment, I'm all set to start playing Round 2, so I'm going to update as fast as I can so I can get you guys up to date. So one down, two more updates to go!!! The update for the Westcliff's family is up. See you guys there! The Rafferty family is updated. The St. Vincent updates are up. Enjoy! It's been so long, but I finally go the final family of the 1st Round up. Enjoy the Sabin's family and the first update for Round 2 with the Andre's household. Hi , I couldn't seem to find it on your blog but what mod do you use to change ages ? Also I love your story. Very realistic! I definitely want to play like this now ! Hey Hollywood! I'm really glad you enjoy the challenge so far. If you're playing it, are you planning to post it? it'll be nice to see another Neperis' version challenge out here. As for the mod, are you referring to the age mod or how I turned aging off for the meeting? Iya wrote: Hey Hollywood! I'm really glad you enjoy the challenge so far. If you're playing it, are you planning to post it? it'll be nice to see another Neperis' version challenge out here. Maybe . My sims 2 went to crap so it may take me a while to post it. But I was referring to the age mod . LOL, as long as you have fun, do what you're happy with. I like to keep them posted because I like to have the memories of each legacies as they continued in the challenge. As for the age mod, I actually used the age mods from Phaenoh's Let's Kids Be Kids series, in which Phaenoh's tries to match up the aging stage a little more realistically. However, I tweaked it with SimPE to get it just the way I like it because I reach day to present a year in real life. So it's not exactly closed to mine, but the closest off all the aging mods out there at the time. I can share with you my version if you prefer. More info about my age mod is here. Also, please note that I also altered my pregnancy (sims & pets) to match my age mod. I'm back for another update. I hope to get more updated soon because I'm too far ahead within the game. I'm on Round 5 in the game I got 22 updates pending! How did i left myself go this far!! !